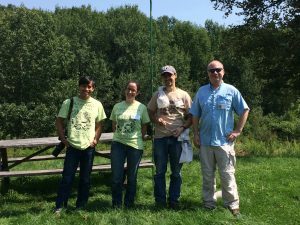 Six members of the Biology Department took part in a BioBlitz (an event celebrating biodiversity by identifying as many living things as possible in a delimited space and time) at Lackawanna State Park on August 23-24. Professional and amature naturalists united in teams specializing in different groups of organisms, with members of the public invited to come along and learn. 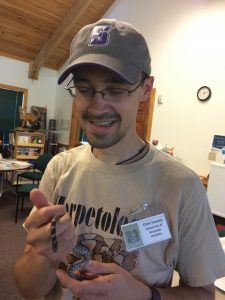 Dr. Howey with his favorite find, an Eastern Milk Snake. The U was represented by professors Rob Smith (birds), Chris Howey and Vince Marshall (reptiles and amphibians), Marc Seid (insects), Gary Kwiecinski (bats), and Anne Royer (plants). Check out media coverage of the event here, view photos of many of the species observed here, and see more photos of the BioBlitz (including our Dr. Smith interacting with visitors) at Lackawanna State Park’s page here.